ISIC is a Hero in Battleborn. He is unlocked at Command Rank 30 or by completing The Algorithm Story Mission. Once the lead manufacturing Magnus of Minion Robotics, ISIC abandoned his post to crash reality itself through the application of unthinkably complex code. Though debugged by Kleese, this Magnus is still regarded as among the most nihilistic and terrifying of the Battleborn. 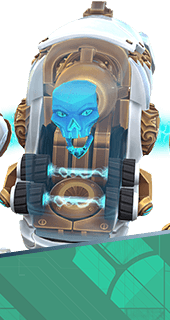 Activating a skill while ISIC's Charge Cannon is fully charged empowers that skill with additional Overcharged effects, and consumes the charge. Enemies afflicted with Overcharge suffer increased damage from ISIC's melee attacks and Rotating Wards. ISIC's Charge Cannon can be fired instantly for low damage, or charged for greater damage to multiple targets. Charging reduces ISIC's movement speed. ISIC's secondary attack deploys his Energy Aegis to block up to 500 incoming damage. Raise 5 protective wards that orbit ISIC for 8 seconds, each blocking up to 315 damage from enemy fire. Overcharged: Each ward blocks up to 365 damage. ISIC charges to a target location while engulfed in plasma, dealing 280 damage to enemies along the way. Overcharged: Deal 325 damage to hit enemies. Toggle turret mode, replacing basic attacks with weapons that deal 24 and 140 damage per shot. Overcharged: Gain 787 overshield on activation. While Rotating Wards is active, each ward reduces ISIC’s shield charge delay. Up to -2.5s Shield Recharge Delay. Plasma Dash deals bonus damage to shields when Overcharged. +50% Bonus Damage to Shields. When Overcharged, Rotating Wards reflect enemy fire. Concentrates Rotating Wards into charges that damage enemies on contact instead of blocking inbound damage. 158 Damage per Charge (Overcharged: 183 Damage). Increases maximum shield strength. +240 Maximum Shield Strength. Using your Charge Cannon no longer slows your movement speed. Enemies hit during Plasma Dash are knocked back. Each enemy hit by Plasma Dash increases the damage dealt to subsequent enemies. Additional damage is reset with each use of the skill. +5% Damage Per Enemy Hit. Shields regenerate faster while ISIC’s Charge Cannon is Overcharged. +105 Shield Recharge Per Second. Increases movement speed while Overcharged. +50% Movement Speed. Increases Rotating Wards block strength. +225 Ward Strength. Reduces Plasma Dash cooldown time. -20% Cooldown Time. Increases the amount of damage ISIC's Energy Aegis can block. +100% Damage Blocking. Decreases the time required to charge up ISIC’s Charge Cannon. -25% Weapon Charge Time. Increases the maximum lifetime of Rotating Wards. +6s Ward Duration. When Rotating Wards expires, the skill’s cooldown is reduced slightly for each ward still active. Up to -50% Cooldown Time. Increases Plasma Dash speed and maximum range. +50% Plasma Dash Speed and Max Range. Increases size of area damaged by Plasma Dash when Overcharged. +50% Damage Radius. Activating Omega Strike deploys Energy Aegis to block inbound damage from the front. Should Energy Aegis go down, it will redeploy after 6 seconds. +500 Damage Blocking. While Omega Strike is active, hitting an enemy directly with a Cannon Shot launches a barrage of missiles. Launch 2 Missiles, Each Dealing 94 Damage.